Rype Reviews - Will It Really Help You Learn a New Language Online? Rype is a subscription-based language-learning site through which you can access 30-minute or 60-minute language lessons with a top-notch tutor. The languages available through the site are: English, Spanish, French, German, Mandarin, Italian and Arabic. According to a Medium post by founder Sean Kim, the site is working toward making Japanese, Russian, Portuguese available, too. 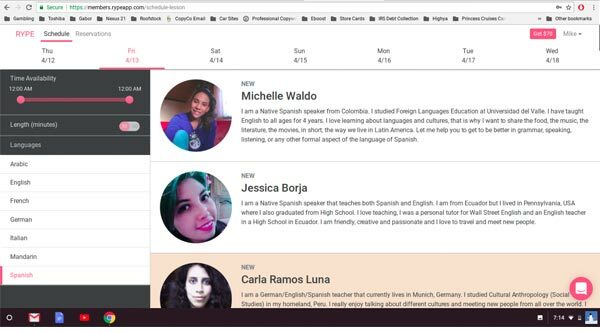 Kim launched the site because he saw an opportunity to provide a website for language learning that combined expert teachers, fair prices and was designed for busy people. Language learning has been a big business for a long time. Language schools, private tutors, and software reigned supreme for many years. As apps have emerged first through Facebook and then through mobile phones, language learning has become more accessible than ever. Therefore, it’s important to be discerning about how you learn a language. It takes a lot of time and, in most cases, a lot of money. Once we’ve covered each of these areas, we’ll conclude our review talking about the site’s pros and cons, then let you know who we think is a good fit for the site. To understand what the user experience is like, we signed up for a seven-day free trial. Because of this, we were able to set up an account, search through their teacher database and get a pretty hands-on grasp of what the service does and doesn’t do. If you’re like us and sign up for the free trial, the process will require a credit card number, your full name, email address, and a password. You’ll also be asked which language you want to learn. Once you have this information entered, your free trial kicks in and you click through a couple of screens to get to your dashboard, which is comprised of a booking page and a reservation page. When we clicked on the option to book a lesson, Rype’s strength really shined: the booking engine. The site allows you to pick days and time ranges during which you’re available, kind of like how you can choose flights based on dates and departure times. The site will narrow down your search results and provide you with a real-time list of which teachers are available at the times you’re available. Booking a time is as simple as clicking one button and, if necessary, leaving a few notes for your teacher. Head to the Reservations tab to view the upcoming lessons you’ve reserved and to cancel them or reschedule them. As for the quality of the teachers you find, Rype’s website claims that all of their teachers "have professional teaching experience and have their own resources when it comes to teaching you a language. This means that language lesson plans will vary from teacher to teacher, language to language, and so on." Rype’s teachers have professional teaching experience and will work with you to come up with a lesson plan that will help you reach your language-learning goals. One of the things we noticed Rype’s home page is their Masterclass language series, a four-part video course designed to expedite your learning process by providing tips gleaned from linguists and language-learning experts. Basically, this course is intended to supercharge your language learning through advice from people who know languages inside and out. Rype’s founder says that Rype users who do the course show more progress in their lessons than those who don’t. The video series is free for those who enter their email address. Rype also offers a free ebook with helpful tips for learning languages quicker. Based on our research of Rype, the two easiest ways to reach them are by the chat support they have on their website and by scheduling a call with their support specialist Michele, who, according to her chat profile, is based in Cape Coral, FL. We asked Michele if it was possible to book same-day sessions. After two hours, we’d yet to receive a response, which isn’t entirely out of the ordinary. Many companies who use chat support will respond by email later in the day or the following day. However, a few days later, we sent an email requesting that our free trial be canceled and Michele responded within minutes. Rype has a two-tiered fee structure: Rype GO and Rype X. Rype GO gets you unlimited 30-minute sessions each month. Rype X gets you unlimited 1-hour sessions. Rype X presents the better value because you’re getting lessons that are twice as long as Rype GO but the fees are less than twice as much. However, you’ll have to decide for yourself if you have the time for the one-hour sessions that come with X.
Rype’s FAQ section notes that you could be on the hook for cancellation fees if you end your contract early. How do these prices compare to other types of language learning like language schools and software? That’s what we’ll cover in the next section. Rype offers an advantage over language school because you get to do your lessons from the comfort of your own home. If you want to learn Spanish in bed, you can learn Spanish in bed. Also, you can work with your instructor to come up with a personalized lesson plan tailored to your ability and skill. Software like Rosetta Stone, on the other hand, is equally as convenient but it doesn’t leverage real-life conversations between an expert and a student, nor does it tailor a lesson plan to your ability. And, speaking as someone who went to language school and was learning Spanish in Spain, it’s the face time with real humans – the listening, processing and responding – that really sharpens your skills. The main advantage to software, though, is that it’s cheaper than language school and Rype. A one-year subscription costs $179. As far as language schools go, my experience is that their curriculum is designed for groups at certain skill levels. Basically, they group everyone together based on how good they are at the language, then teach them in bulk. This isn’t necessarily a bad thing if their classes are conversation-heavy and your goal is to be conversational. There isn’t nearly the customization that you could get from a Rype lesson plan, but, then again, some language schools offer private sessions where you can fine-tune your skills in a one-on-one setting. However, these lessons come at an additional cost, in most cases. As far as cost goes, language schools in the United States can be more expensive or cheaper than Rype’s annual or monthly fees. For example, taking a Spanish course at a local community college may be around $400 for a four-month semester, whereas four months of Rype GO at the month-to-month rate would be more than $700. The advantage Rype has over taking language courses at a community college is that you can take lessons at any time during the day because you can form your lesson schedule around your work and family schedule. Colleges and/or language schools tend to offer courses at specific times during the day, times that don’t change to accommodate your situation. Rype’s strengths are that you can choose lesson times that work for you and you can take as many lessons as you need for one flat rate. We also like how their teachers have, according to Rype, professional teaching experience. The downside to the site is that, while you get to spend 30 or 60 minutes with a private tutor, the monthly fees you’ll pay may not be doable for you if you’re on a tight budget. Granted, those fees are cheaper than what you’d pay for a language school or weekly sessions with a tutor in your area. In our opinion, Rype is an excellent choice for someone who doesn’t have much time to take language lessons and wants a way to get private lessons at times that are convenient for you. Also, based on our research, we think this site is best for someone who is disciplined. Your Rype membership could easily turn into a gym membership in which you’re paying every month but not using Rype’s teachers. In today's tech day and age, this the first time I've had a company refuse to refund me when I didn't use their services at all. I was late in canceling my free subscription one day, and even then, they would not refund me. That's how they get you. I wanted to cancel because their services are subpar. Their teacher selection is tiny compared to services like iTalki, and the teachers are not certified. Literally we are paying these teachers significantly less than minimum wage, and this is really unfair after Rype takes a cut. Do not enter your credit card details, they will try to charge you. It is really hard to cancel your subscription, so you will pay for the next month (or 6 months!) even if you tried to cancel. They are a scam, check on internet "Rype scam." I started with a trial. The app is only to find a teacher and book a class. First of all, this does not have a conference room, you need to use your own apps to contact the teacher. Secondly, when I started using the app, I created a trial, you need to capture your credit card details. Until this point everything ok...Then I decided to continue trying the app for one month, for which I left to Rype to charge me for one month. I decided to not continue with the app as I didn't feel as too helpful with the objectives as they promised. When I tried to cancel, the process was manual - you need to send an email to ask for cancellation. There is no information about billing details or plan details in their app. They replied one day after mentioning that I was under a 6-month plan, which I didn't sign up for. They never replied to my next email, and they just tried to charge again for the next month. I'm a graduate student and am therefore very tight on time and money. After weighing all of my options, I decided to give Rype a try. I have been thoroughly impressed with the quality of the language coaches. I say "coaches" instead of tutors because this system is made for those who are motivated to learn a new language and can do some independent study. The coaches provide lots of resources and activities for you to practice. They are professional, yet approachable and friendly. Experience in language teaching seems to be a prerequisite for the job. I chose Rype because it was cheaper than classes or peer-tutoring offered through the University. I have found Rype to be a terribly convenient way to get one-on-one language lessons. I like to book my sessions for first thing in the morning. It's a great kick-off to the day and helps me feel like I've accomplished something even before I've had breakfast or left the apartment! Many of the language coaches are overseas, which I actually prefer because it means I can book sessions outside of the usual 9-5 hours for my timezone. I have also been impressed with Rype's customer service. I wish they had a phone number to call, nonetheless, they are responsive on the website's live chat feature and via email. When I sent emails, I got responses nearly immediately, often from the CEO himself, Sean. The website itself is well set up, naturally navigable, and aesthetically pleasing. Designing a website like this is easier said than done. I even like the name. Yes, these things matter to me, especially if I'm paying for it and have to look at it nearly every day. Rype is a great resource, I highly recommend it. On top of being able to find pre-vetted teachers (saves me time from interviewing or doing background checks), Rype allows last-minute cancellations when something has come up. I've been learning with the service for over a year now and even got my son to start using it to learn Spanish. I've been learning with Rype for about 15 months now, and they've made significant improvements with their platform and overall experience. I've been learning Spanish over the past year and now moving on to French with the app. Given how much time I can save versus learning from an in-person classroom, which is what I was doing before. I'm not sure about the browser issue, because I use the platform on Safari and Chrome, so I highly doubt that this is an issue for everyone. Seriously? In 2018 someone has a website that is incompatible with two of the largest browsers on the planet? I, of course, only discovered this after signing up, and after wasting a ton of time trying to use the site, schedule lessons, etc. The site has "amateur" written all over it. That, in turn, tells me they are out to rake in as much as they can for as little money spent in coding as possible, and when the tech collapses (browsers issue updates, etc. ), they will probably pack it up and bolt. A great business idea, and I'm sure its great for those with whatever machine and browser are compatible, which they cannot even tell me what that might be! Lame, lame, lame. It's a high-risk proposition, as they take your money up front. They really push for 6-12 months worth too! You think a site that can't service basic, been-around-forever-browsers will continue to be around? Spend your hard earned $ and found out! Write a Review for Rype!